Hey everyone! I meant to come back and post this yesterday since I gave you a little sneak peek, but I got so busy and spent all day stampin' today that I forgot to until now! Sorry about that! Anyway, I belong to an online group of super stampers and they issue weekly challenges that you can sign up for. This one was called the "Crystal Ball" Challenge because we were to make a card for our challenge partner with a stamp set that we think will be retiring on July 1st! Don't forget - I get the Last Chance Lists on Monday, June 1st! Exciting times......! For my card I chose to highlight the Doodle This stamp set. It's one of my all time favs, but I have a gut feeling that it's gonna go bye-bye in this next catalog. 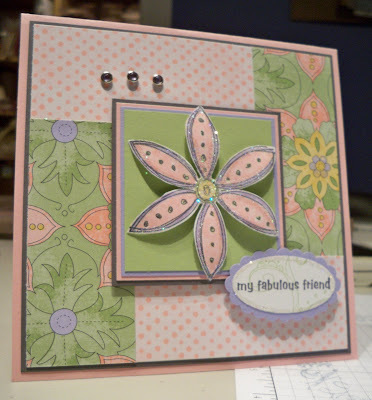 I CASE'd a layout that I'd seen Connie Babbert do for another challenge a while back - I hope you like my card Connie! Be sure to check out her original card here. To get the flower petals to curl for my card, I just ran each one in between my Bone Folder and my thumb like curling ribbon for packages. Easy-peasy! This is so pretty! I really love the colors you used. I LOVE the Tea Party paper. Haven't bought any yet. If they retire that I'll have to buy bunches!